For those women, it can be easy to get lost in a sea of conflicting information—not just on the Internet, but also from doctors and well-intentioned friends and family members. In the interest of caring as well for CrossFit South Brooklyn’s community of women and parents as possible, our staff decided to enter the conversation from our perspective and experience. To that end, on CFSBK’s blog, we are publishing a series of three articles titled “CrossFitting While Pregnant: An Interview with Four Women and a Coach” (read Part 1 here, Part 2 will be published tomorrow, and Part 3 on September 30). The article is comprised entirely of interviews with four CFSBK members who became pregnant during their training and one of CFSBK’s coaches, Chris Fox (who you've heard from before on ITA). Our approach is simple, and acknowledges that everyone’s experience is different—and that the most important thing for women is to listen to their bodies. But on Inside the Affiliate, we want to help you, as a coach and affiliate owner, by sharing more of our guidelines for training these women. Coach Fox created a document that CFSBK will now use as guidelines for both our coaches and pregnant women. We’ve included that document below. Congrats on bringing a new human, and potential new CrossFitter into the world! 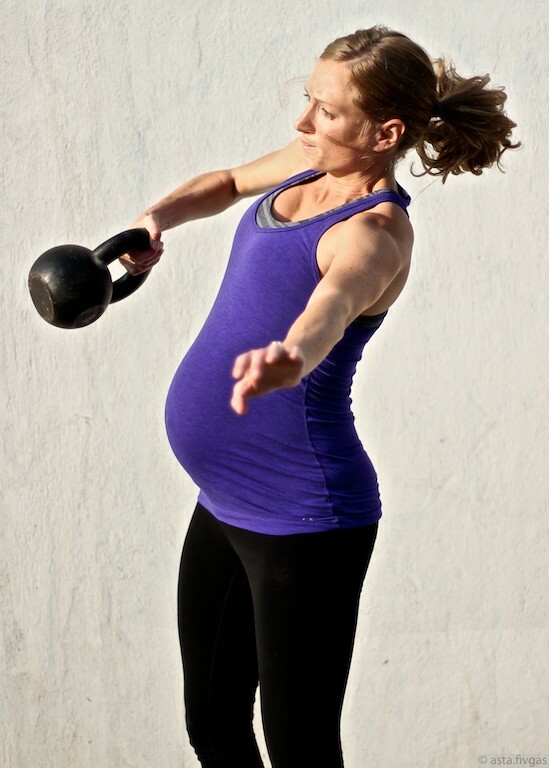 At CrossFit South Brooklyn, we fully encourage your regular participation in classes throughout your pregnancy and believe that regular exercise is of great benefit to you and your baby. You’ll be your own best judge of what’s appropriate to do or not do, so we strongly encourage that you to listen to your body on a day-to-day, and rep-to-rep basis. That said, below is an overview of what you (and your coaches) can expect as far as training during pregnancy. Please note that our protocol is to inform the entire staff so we can all be on the same page. Additionally, please make us aware of any complications/medical issues so we can help to adjust your training accordingly. Otherwise, get ready to enjoy the journey! In the first trimester, little may change as far as training. Supine exercises such as sit-ups and bench press may still be performed. Training right now may look pretty similar to pre-pregnancy. If you’ve been doing CrossFit regularly, then you can likely continue to use your regular weights—but be mindful of overall intensity. Look at this as a time to maintain your fitness rather than improve upon it. Max effort lifts and high intensity WODs should be approached with more moderate effort (i.e., heavy-ish triples instead of 1RMs, and a level of exertion that feels like a 7 or 8 instead of a 10 when “Fran” comes up). Our best advice is to keep training to a conversational level throughout pregnancy. If your coach or training partner asks “How are you feeling right now?”, you should be able to answer with a sentence or two rather than a few gasped words. Another consideration is morning sickness, which most often is a factor during the first trimester, and even more so in the morning. Let your body be your guide here. If you’re experiencing morning sickness, then as much as possible, try and schedule your workouts later in the day to avoid training while nauseated. You may find that after being awake for a few hours and having had a small meal, you will feel better during training. If you come to class and find that you are not feeling well, don’t be afraid to ease off or stop altogether. If this is ever the case, please let a coach know. During the second trimester, especially weeks 20 and beyond, you’ll become mindful of a few new things and should augment your training appropriately. Any exercises that involve lying on your back for a prolonged period should be avoided as the size of the uterus can be large enough to impede blood supply to you and the baby. We’ve found that most women can continue to bench press comfortably throughout, but some cannot. Again, listen to your body. If you feel lightheaded upon rising from a bench, consider it a sign that you should discontinue the exercise. Sit-ups should be avoided due to the increased risk of diastasis recti. Additionally, the size of your growing belly will become a factor in whether or not you can safely and/or comfortably perform certain movements. Exercises that involve the risk of falling should be avoided, particularly inversions, rope climbs, kipping pull ups, and box jumps. Due to the release of the hormone relaxin from the end of your first trimester, you should begin to modify dynamic movements such as Olympic lifts, particularly those involving squatting-type motions. Overall intensity both during met-con and strength training should decrease again. Beyond the general recommendation to decrease weight and intensity, we’ve included a list of alternates to the contraindicated exercises below. When in doubt, ask your coach. And again, listen to your body. Sit Ups = plank, pallof press, slam ball, side plank, supine pelvic tucks, hanging knee raise. Bench Press = press, push up (elevated as necessary). Handstand Push Up = dumbbell or barbell press/push press. Box Jump = lower box at first, and then step up. Kipping Pull Up = should be on low bar and then strict or ring row. Kettlebell Swing = possibly fine throughout, may modify to single arm swing for comfort on the back swing. Deadlift = possibly ok throughout, though sumo or kettlebell deadlifts may be more comfortable. the second trimester on, perform the power version of the movement and then squat under control. Dynamic squat versions of the lifts should be avoided. Moderate load deadlifts are also a great sub. Jump Rope/Running = as far as your level of comfort allows, keep doing them. Rowing is a good sub, as are kettlebell swings and/or slam ball for a similar metabolic effect. Thrusters/Wall Ball = controlled squat and presses, either with a barbell or dumbbells. Push Ups/Burpees = on a raised surface, i.e. parallettes or a bar in a squat rack. Down the home stretch, it’s more of the same from the second trimester. Continue to avoid exercises that involve the risk of falling. Balance may feel awkward, especially depending on how large you’re carrying and whether your joints are more lax. A growing belly means that you’ll need to modify many movements based on comfort level, and knock intensity down even more. Decreasing intensity is almost always self-regulated. Don’t feel like you have to push harder or match your pre-pregnancy efforts to get in a good workout. Any day that you get in to move around the gym is great for you both physically and mentally. After 4-6 weeks, depending on how you feel and the advice of your doctor, we’d love to see you start coming back to the gym. Coming to class and moving around will be great for both your body and your state of mind. Our chief advice here is to take it slowly and be mindful of your recovery. Don’t attempt any max effort lifts for some time, from 6 to possibly 12 months. Your abdominal wall and pelvic floor muscles have undergone significant stress and need time to re-condition (more on diastasis recti and the pelvic floor below). A good way to consider postpartum training is to think of it as if you were starting over—albeit more knowledgeable than before and with a faster adaptation rate. You’ll eventually get back to where you were but you’ll need to take some time. Be sure to eat plenty of healthy calories from all the macros: proteins, carbs, and fats. This is especially important if you’re breastfeeding. Not only are you working out again, but you’re also feeding a small person. Decreasing milk supply may indicate that you should increase overall calorie intake. Additionally, once you’ve resumed your training, ease back into dynamic movements slowly. Your ligaments will be loose from relaxin for some time—some say up to 10 months—and dynamic stabilization challenges these tissues. Diastasis Recti: Separation at the linea alba of 2.5 fingers wide or more, while considered problematic, is common. The above link provides some great exercises and practices to help avoid and/or lessen diastasis recti. In any case, avoid heavy lifting requiring a strong “brace” of the abdominal muscles for a period of 4-6 months post pregnancy. Better to start back light and easy, and slowly build your way back to your previous level of fitness. Peeing: During pregnancy, the extra pressure on the bladder by the baby often causes urinary incontinence, and postpartum, it may be due to pelvic floor issues. The latter is addressed below. While some of this unfortunate side effect may be unavoidable during pregnancy, avoiding jumping- type activities can help, such as jump roping and running. C-section: On top of dealing with postpartum issues you’ve also had major abdominal surgery that you’ll need to recover from. The link provides some useful info for post-cesarean recovery. For the first 6 weeks, post-surgery you should limit exercise to pelvic floor exercises and easy walking, as it becomes comfortable. Pelvic Floor Muscles and Pelvic Organ Prolapse: While the abdominal wall has the full term of the pregnancy to stretch, the muscles of the pelvic floor endure much of the stress in a few hours. The muscles of the pelvic floor can become very weak and suffer trauma in births that require a long pushing phase. The effects of this can range from stress-induced urinary incontinence to a prolapsed uterus or bladder, the latter two sometimes requiring surgery. The common recommendation is to perform kegel exercises to strengthen the sphincter muscles in the pelvic floor, and this can be followed throughout pregnancy as well as in the postpartum period. This will help to strengthen the muscles and connective tissue, making them more flexible and as such, more resilient. Be sure to perform deep squats daily as well to balance out the strength and length of the entire pelvic floor, as deep squats utilize the glutes and promote proper pelvic alignment. Additionally, the previous recommendation to avoid the strain of heavy lifting for a period of 4-6 months is prudent. Better to start back light and easy, and slowly build your way back to your previous level of fitness. This is a phenomenal resource. Thank you! This is great information. Thank you for sharing. This blog is full of grace, it is the great source of inspiration for pregnant women. Greate site :) great to know that pregnant women also can practice !! This is really helpful. Unfortunately I don't feel like my cf coach has done any research or anything to help me figure out what would be best, how to modify, etc. I have to figure a lot out on my own and of course just listen to my body. It's unfortunate. I'm their first pregnant client so you would think some effort would be put in on their part. During pregnancy exercise and morning walk is best and safe and helpful for the preparation of body for child birth. If you want to look fit during pregnancy then exercise is the best practice. Due to this step baby will be born healthy and fit. Thanks for the article. This is my second pregnancy doing crossfit and all of a sudden its week 37 again. It has been a sanity saver to be able to continue training, with the most important guideline to listen to your body. People are often very eager to 'give pregnancy advice' to expecting moms and that's why I think it 's so important to share stories on training during pregnancies to emphasise that in many cases it is a completely normal thing to do. I am SO glad I found this! I am in my first trimester and have been crossfitting for 3 years, not planning to give up now!!! Thank you so so much for the advice! Glad to know important tips to have your post. It can help us to born healthy baby with mother. Thank you so much for the advice. Any advice on t2b? I'm 26 weeks and was doing them(but not getting my toes to the bar) after the workout I felt my abs burn a little and it made me really nervous! What are some good scaling options? I've been crossfitting for 3 years and am on my second pregnancy while being a crossfitter! Thank you! This is a brilliant blog piece. We've been slowly working on pregnant and kid friendly xfit workouts to introduce both classes at our gym, but started to feel that it's a very grey area in terms of being safe and affective, with the most accurate information. Our next step is to have some medical professionals evaluate our programs for that final tick of approval. Could you recommend anymore online resources for both pregnant and kids training?? Thanks for all the blog love, everyone. Bridget, I would do hanging knee raises or planks instead of toes to bars. If you do hanging knee raises make sure you're using a low pull-up bar so that there isn't any risk of falling off something high. Often times after pregnancy you will have limitations in your fitness abilities. Taking a class is a good option, but finding an affordable trainer can often be a better option. They will be able to tailor a program to meet your needs and back off when your body needs it. They can also give you that extra little motivation to show up to the gym. It really comes down to the individual. Thanks for some great information! I'm 19 weeks pregnant with twins, and it seems that I've developed diastasis recti from one day to the next. Do you have any tips on what I can continue to do excercise wise for the rest of my pregnancy? Beyond avoiding the obvious ab work, anything else I should not do?